The global telecommunication services market is prophesied to lay its hands on a substantial growth due to the need of telecom operators to optimize their business processes. There is a rising pressure on telecom operators to grow in the current market and operate profitably owing to the industry’s increasing competition. New service launches and continuous mergers and acquisitions in the market are expected to further intensify the level of competition in the industry. Thus, competence needs and financial pressure could be among the top growth factors of the market. Anticipated to expand at a CAGR of 6.6% between 2017 and 2025, the global telecommunication services market could obtain a valuation of US$1.4 bn by the concluding forecast year. In 2016, it exhibited its prominence while securing a US$0.8 bn valuation. End-use vertical and package type are the two main segmentation categories that the world telecommunication services market is classified into. With regard to package type, companies are projected to concentrate on three crucial segments, i.e. quad play, triple play, and double play. Amongst these types, quad play is predicted to account for a faster growth rate until the end of the forecast period. This could be because of the escalating rate of the adoption of quad play services chiefly by micro, small, and medium enterprises (MSMEs). Nevertheless, a higher market share is prognosticated to be secured by triple play, considering its outclassing performance in 2016. By end-use vertical, the world telecommunication services market is cataloged into two of the most common segments, viz. commercial and residential. Out of these, the residential segment is foreseen to hold a dominating share of up to a 61.8% in the market, whereas the commercial segment could rise at an outshining CAGR during the course of the forecast period. The growth in the commercial market is forecast to attain strength on the back of the accelerating demand for bundled services due to their high quality and lower rate. Followed by North America, Asia Pacific is foretold to showcase its supremacy in the international telecommunication services market while being valued at a US$0.5 bn by the end of 2025. The increase in Asia Pacific’s market share could be attributed to the swelling adoption of telecom enterprise services in Japan, China, and India particularly. Furthermore, the region is studied to be a major exporter and manufacturing hub of information technology enabled services (ITES) and IT products. Europe, on the other hand, is expected to exhibit a higher CAGR growth due to the setup of small businesses encouraged by government regulations and the presence of a large count of SMEs. Asia Pacific is testifying of a continuous surge in the count of startups offering web-based services for manufacturing companies functioning in different end-use industries. Other factors such as rising population, increasing penetration of internet, and rapid adoption of mobile devices are envisaged to up the demand for telecommunication services in the region. Moreover, industries such as IT, banking, financial services, and insurance (BFSI), healthcare, retail, and ecommerce could set the tone for a valuable growth in the region. Some of the competent companies of the worldwide telecommunication services market could be Rogers Communications, Inc., TalkTalk, Telus, Vodafone Group PLC, and AT&T Intellectual Property. This report on the global telecommunication service market provides analysis for the period 2015–2025, wherein 2016 is the base year and the period from 2017 to 2025 is the forecast period. Data for 2015 has been included as historical information. The report covers market dynamics including drivers, restraints opportunities, and trends expected to influence the global telecommunication service market growth during the said period. Technologies that are playing a major role in driving the global telecommunication service market have also been covered in the study. The study provides a comprehensive analysis on market growth throughout the above forecast period in terms of revenue estimates (in US$ Bn), across different geographies. The report also includes key developments in the telecommunication service market form 2006 onwards. Porter Five Force analysis which identifies bargaining power of supplier, bargaining power of buyer, threat from new entrant, threat from substitute and threat from competition in Telecommunication service market is also included in the report. Value Chain analysis which identifies key stake holders in the telecommunication service market is also covered in the report. The global telecommunication service market has been segmented on the basis of package Type, end-use, and geography. Packaging type is further classified into double play, triple play, quad play. The global telecommunication service market is bifurcated on the basis of end-use such as residential and commercial. 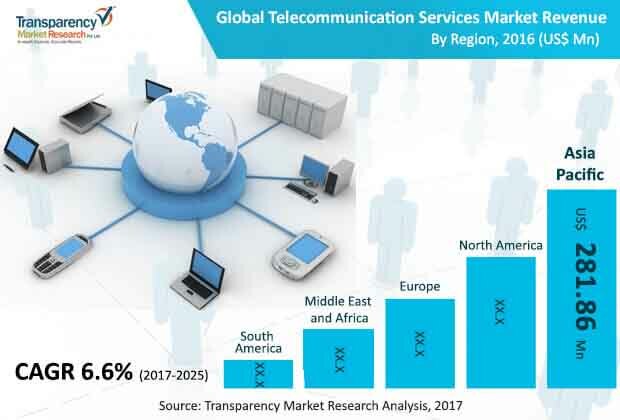 Geographically, the report classifies the global telecommunication service market into North America, Europe, Asia Pacific, Middle East & Africa (MEA), and South America; the regions are analyzed in terms of revenue generation. Furthermore, region wise prominent countries covered in the report include the following - the U.S, Canada, Germany, France, U.K., China, India, Japan, GCC, South Africa and Brazil. The report also includes competition landscape which include competition matrix, market share analysis of major players in the global telecommunication service market based on their 2016 revenues and profiles of major players. Competition matrix benchmarks leading players on the basis of their capabilities and potential to grow. Factors including market position, offerings and R&D focus are attributed to company’s capabilities. Factors including top line growth, market share, segment growth, infrastructure facilities and future outlook are attributed to company’s potential to grow. This section also identifies and includes various recent developments carried out by the leading players. Company profiling includes company overview, major business strategies adopted, SWOT analysis and market revenues for year 2014 to 2016. The key players profiled in the global telecommunication service as a service market include Virgin Media, Verizon Communications, Orange S.A, Telefonica SA, T-Mobile, Bharti Airtel, AT&T Inc., TalkTalk Telecom Group plc, Vodafone, Telus Communications, Telnet Belgium, Rogers Communications, BCE Inc. etc.